State schools in England have seen a 21% decrease in music provision over the last five years, research suggests. At the same time, access to music in independent schools has risen by 7%, according to figures from the BPI. 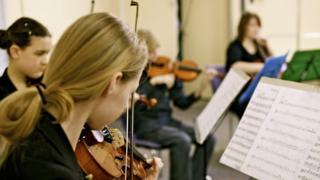 The gap widens amongst poorer pupils, with just one in four schools in deprived areas offering music lessons. "You can't imagine how distressing that is to hear," said Chi-chi Nwanoku, founder of Chineke, the UK's first majority-BAME orchestra. "But it's not news to me - because I know that music and the art subjects are being systematically stripped out of all of our schools - and that always hits the kids who go to the free schools." The BPI surveyed more than 2,000 teachers in England for its report. One in five primary school teachers reported there was no regular music lesson for their class, and only 12% of schools in deprived areas have an orchestra, compared with 85% of independent schools. The figures reflect similar studies in Scotland and Wales. BPI chief executive Geoff Taylor said he was "profoundly concerned" by the division between state and independent schools, and called on the government to intervene. "This inequality is not just deeply unfair to children in the state sector, it risks depriving our culture of future talents as diverse as Adele, Stormzy and Sheku Kanneh-Mason," he added. A Department for Education spokesperson said: "Arts education programmes receive more money than any subject other than PE - nearly half a billion pounds to fund a range of music and cultural programmes between 2016 and 2020. "This money is in addition to the funding that schools receive to deliver the curriculum." They added the department will be working with music groups and practitioners "to refresh the national plan for music education" to "develop a high-quality model music curriculum, which the British Phonographic Industry welcomes". Speaking at the Global Awards in London on Thursday, saxophonist Jess Gillam said the situation had reached "a crisis point". "It's about so much more than learning an instrument," she added. "It's scientifically proven it helps academic results and it helps children socially. We need to do everything we can to make sure children have that." Violinist Nicola Benedetti said educators and the music industry were "all agreed" that provision was decreasing, but argued the response needed "more co-ordination". "Inevitably if government funds go down, then private institutions need to step up," she said. "Where the money comes from is not as important to me as the money going towards quality work. Those of us who go into schools and work with children need to co-operate with those of us who are CEOs and in positions of power." In the meantime, many classical musicians are striving to reach young audiences in new ways. Chineke recently announced a concert at the Royal Albert Hall with techno pioneer Carl Craig, and are in the process of recording new orchestral arrangements for a Bob Marley compilation album. "We're getting used to doing this kind of thing," Nwanoku told the BBC. "It's opening everyone's eyes and ears and taking us out of our confined genre." Soprano Joanna Forest is taking her music directly to pupils - performing workshops in primary schools to promote her new album. Called The Rhythm of Life, it's a concept record about a day in the life of a typical child, featuring orchestral versions of Take That's Greatest Day and Clare de Lune, and a guest appearance from CBeebies presenter Andy Day. "It's so important for children to get the opportunity to experience as much music as possible, from all genres," she said. The singer spent Thursday morning performing at a school in London's Queen's Park - calling the pupils "my perfect audience". "They were so engaged. There was a lot of movement and clapping out rhythms; and they joined in the singing with me. "All types of music can be beneficial for children, even if they're not particularly musical. It can be calming, or it can fire their imagination." The BBC has also been actively assisting schools by providing music lesson plans, videos and support material through its Ten Pieces project - which familiarises pupils with 10 new classical works throughout the year, culminating in a concert at the Proms. Launching this year's selection on Monday, director general Tony Hall spoke of the importance of music education. "I know how much music can change your life. It changed mine. It could change yours, too, because music can make you look at the day differently; it can give you confidence you never knew you had and it can inspire you. "Perhaps you'll just pick up an instrument for the first time; listen to some music you haven't yet come across; or think about how you can use the talents you have." BBC Radio 3 is also seeking to broaden its appeal by hiring new, younger presenters, including Jess Gillam; while on Monday, Scala Radio launched with the aim of bringing classical music to a younger crossover audience. Amongst its presenters are Simon Mayo, Anthea Turner and pianist Alexis Ffrench, who argues children are more familiar with orchestral music than they think. Video games in particular give fans "an appreciation for the epic power and landscape of orchestral music," he said. Many ensembles, including the London Symphony Orchestra, are staging concerts of music from games like Final Fantasy, The Legend of Zelda and Super Mario Bros - often in venues more commonly associated with rock music. "The orchestras have to survive, and they have to make sure there's an audience that's interested in them," explained Thomas Böcker, who staged Europe's first video game concert in 2003. He said audiences at these shows were "very enthusiastic" and "more attentive" than typical classical music fans. "It's very quiet during the performances - everybody wants to get every detail out of the performance - but once the pieces are played, then you have a reaction like you would expect from a rock concert," he said. But while classical musicians are making renewed efforts to attract young audiences, Nwanoku warned that the disappearance of music from the classroom could have long-term impact. "The knock-on effect is pushing culture and community even further apart from each other," she said. "Music is a combined effort. It's not interesting just to play for yourself. "The orchestra, the artists, the audience, we're all in it together [and] a community without culture is dying."